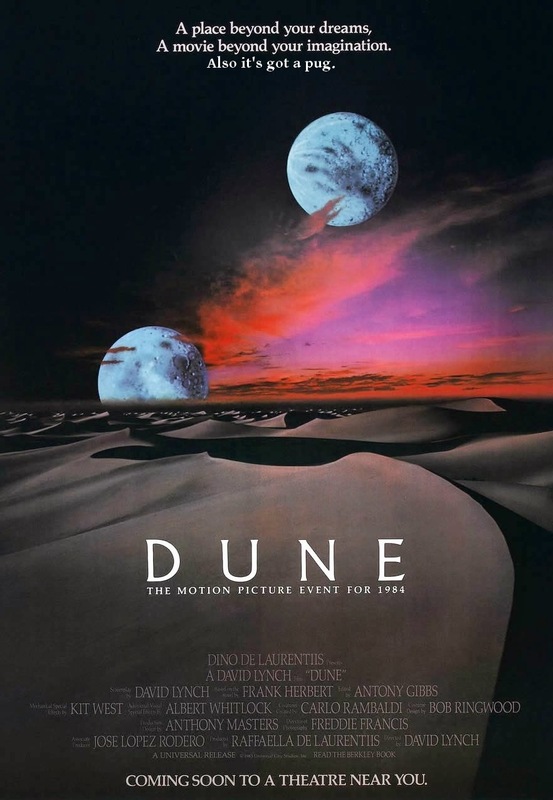 Ah, Dune... a novel of such epic proportions and complexity that it's probably unfilmable. Not that that's stopped people from trying, however. "They tried and failed ?" "No, they tried and no-one liked it very much." Unless you read the book, David Lynch's 1984 movie is, at best, a broken masterpiece. Rich, dark and with a soundtrack to match, it also just doesn't make any sense. And why should it ? About half the book consists of what characters think other characters are thinking - and what they think they're thinking isn't always what they're really thinking, I think. You can't really film that. However, it adds at least one detail to the Dune story that puts a rather different slant on the whole shebang. I'm talking, of course, about Paul Atreides' pet pug. Knowing pugs, this alters the tone of the entire movie. 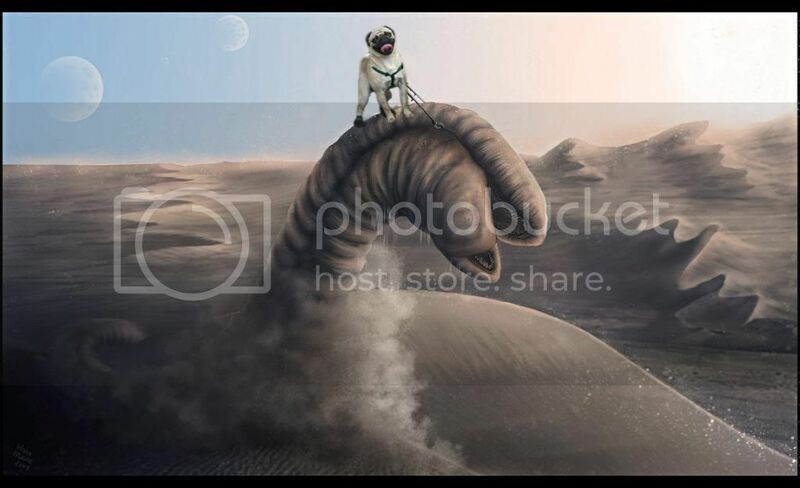 Dune is not hard science fiction, but pugs are pretty consistent with the established universe. Like Paul's tiny Bible*, pugs are small and therefore well-suited to space travel. They can withstand high accelerations due to their natural crumple zone. And, although set at least ten thousand years in the future, the survival of the breed would be assured by the Bene Gesserit sisterhood's enduring eugenics program (were they trying to breed a Kwisatz Haderpug ? we'll never know). *This always bothered me. In the Duniverse, huge space fleets aren't a problem (though they are expensive). Compressing an 1800 page book into something the size of your thumb doesn't seem like much of a saving. One may further infer that the survival of the pugs was guaranteed by the Buterlian Jihad - the war against the thinking machines. Because if there's one thing in the Universe that's definitely not a thinking machine, it's a pug. I CANNOT BRAIN TODAY. I HAS THE DUMB. Paul is clearly quite attached to little Scruffles, because he took him with him from the safe (though somewhat damp) environment of Castle Caladan to the desert furnace of Arakis. What, then, was life like in the Atreides household during Paul's youth ? We will have to assume that Scruffles was much like any other pug. And that means that just occasionally, Duke Leto would have raged around the castle complaining that everything was covered in poop. Lady Jessica would have forbidden Paul from learning the Weirding Way "until all that *! "£@ing pug hair is cleaned up, young man !". Thufir Hawat would likely have complained that even Mentats can't concentrate "with that ugly little runt barking at leaves all day." There is, however, something very wrong with the scene where the Atreides family leave Caladan to board the Guild heighliner, and it's that the family pug doesn't do anything. In the movie I can only assume this was done by lacing Scruffles' food with horse tranquillisers. In the narrative, I expect Paul (or possibly Gurney Halleck) spent his last few hours on Caladan chasing his beloved pug around the castle grounds. Because if God created Arakis to train the faithful, then surely God created pugs to train the patient. We don't see the pug again until the Harkkonen attack. In the absence of Sigourney Weaver - although honestly even if she were available it would be a tough choice - there's only one man Paul trusts to guard his childhood pet : Patrick Stewart, aka Gurney Halleck, weapons master of the Atreides. And thus do we see Patrick Stewart charging into battle, blaster in one hand and pug in the other. "LONG LIVE DUKE LETO.... AND HIS PET PUG, SCRUFFLES !" I don't know who made this image but I'd like to thank them. ... because we do know the pug survives. Right at the end of the film, when Paul has brought the empire to its knees and freed the Fremen from the Harkonnen yoke, we can just about see an attendant doing their best to stop little Scruffles from interrupting Paul during his big speech. Is it definitely the same pug ? I don't know, but how many pugs do you think there are on Arakis ? Pretty soon, Europe will be blasting the heck out of a Chilean mountain so that they can build a great big telescope there. This extremely large telescope will be so large, in fact, that they'll call it the Extremely Large Telescope. At 40m across its extreme largeness is beyond dispute. 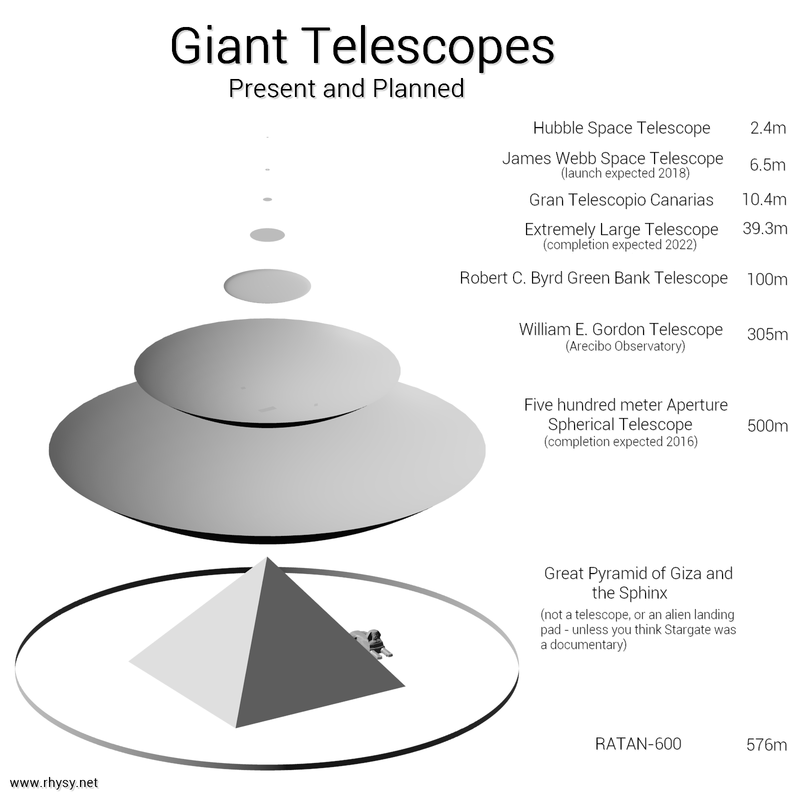 However, some articles claim it will be the world's largest telescope, so here's a friendly reminder that (despite being 40m wide) compared with some other facilities, this will still only be an Extremely Little Telescope. the "Too Big to Fail Telescope", and, of course, the "Telescope of Devastation". Because 300m > 40m. I've counted. Now, obviously, radio telescopes and optical telescopes work very differently, and the challenge of building a 40m diameter mirror is quite different to building a 300m diameter metal bowl. But a telescope is a telescope, and calling the ELT the world's largest is a bit like calling Snowdon the tallest mountain - sure it is, in Wales. Omitting that qualifier makes the statement.... well, wrong. The ELT will be the world's largest optical telescope. And it will be mindbogglingly awesome. But the more general question of "which is the world's largest telescope ?" is slightly more tricky - and much more interesting - to answer. OK, Hubble isn't a giant telescope, but let's face it, it's pretty darn neat. Sphinx model came from here. Anyone who responds with claims about mystical pyramid energy will be given a stern glare. The diagram above shows some notable present and planned classical telescopes - big reflective (single-dish) mirrors that focus light onto a receiver. Several other very large optical telescopes are also planned (e.g. the Giant Magellan Telescope, which will consist of seven massive mirrors stuck together, and the aptly-named Thirty Metre Telescope, the American rival to Europe's ELT). There are also several other large ground-based telescopes already operating (e.g. the Very Large Telescope) and while JWST will be the successor to Hubble, it's worth pointing out that the now inoperable Herschel is currently the largest single mirror* ever flown in space at 3.5m diameter. Many radio telescopes work in the same way as optical telescopes, it's just that the light they collect is a at a longer wavelength. So there's no need to make their mirrors smooth and shiny - they don't care about visible (or optical) light, and the radio waves aren't affected by small bumps in the surface. That makes it quite a lot easier to build really enormous radio receivers. 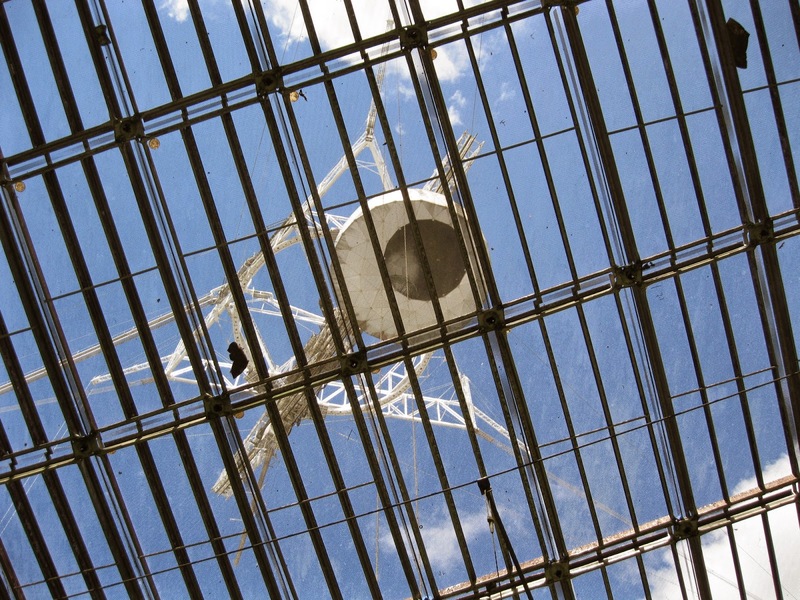 In fact, the Arecibo reflector is pretty much transparent to visible light. To save weight (and, interestingly, also to let enough light through so that the plants underneath don't die), each metal panel has lots of little holes, and you can easily see through it from underneath (just like the protective grille in a microwave oven, the radio waves are too big to pass through the holes). And that raises an important question - does the reflecting surface have to be solid and continuous ? If you insist that the surface has to be like, watertight - then the world's largest telescope is probably the 10.4m GTC in La Palma. And by that rather contrived definition, then yes, the ELT will indeed be the world's largest telescope. A more reasonable interpretation would be that the surface must be continuous at the wavelength it's observing. 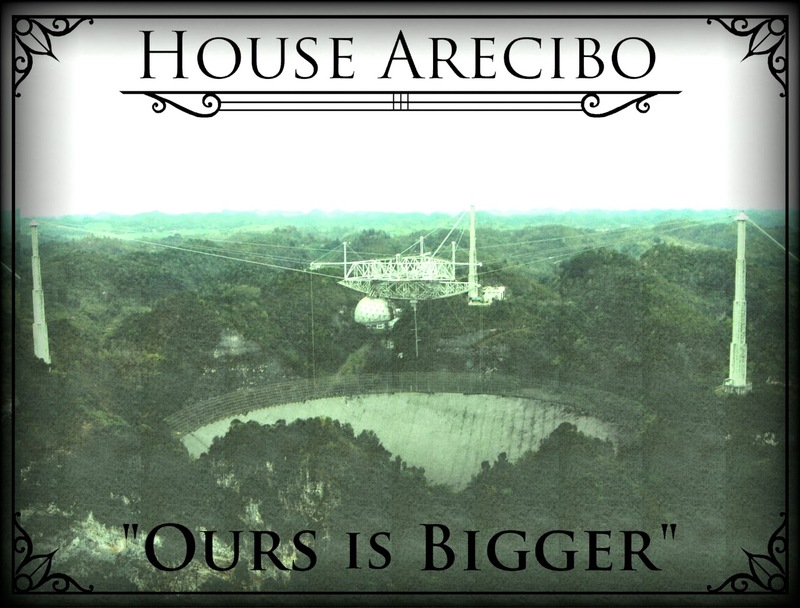 In that sense, Arecibo is a clear winner, and has been for over 50 years. But all glory is fleeting, and in a few years time the massive FAST will dwarf even Arecibo. This 500m behemoth will have the extra complication of a deformable dish - thousands of cables will pull the spherical reflector into a paraboloid, allowing it to point at different parts of the sky. Whether this crazy scheme will actually work remains to be seen. And yet, by taking a few more liberties, even FAST won't be the largest telescope. If you don't mind your reflector having some bloomin' great gaps in it, then the remarkably obscure Russian RATAN-600 claims the prize. This crazy instrument is almost like what you'd get if you built Arecibo without bothering to find a sinkhole for the reflector - basically it's a huge ring of reflectors, 576m across, which focus the radio waves onto a central receiver. My professional opinion is that it's freakin' weird. 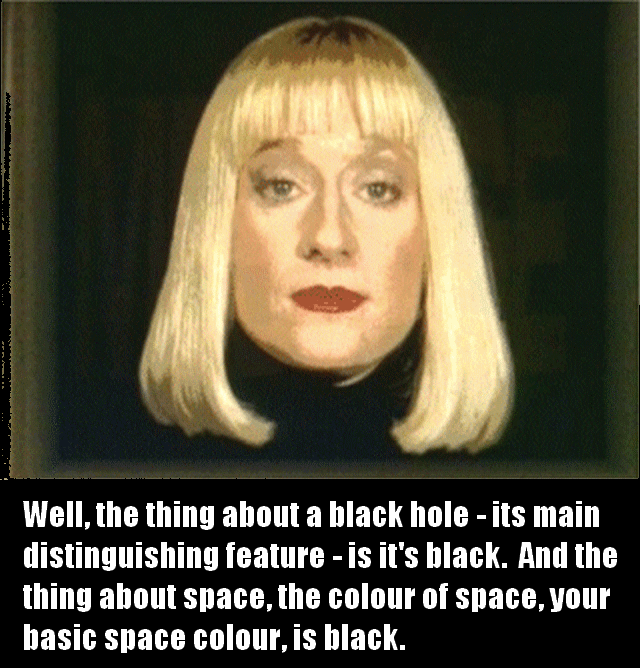 * There's a price to be paid, of course - you can use multiple telescopes to get very high resolution, but you lose sensitivity by having so much empty space (especially to low density material). I suppose it is fairly large. 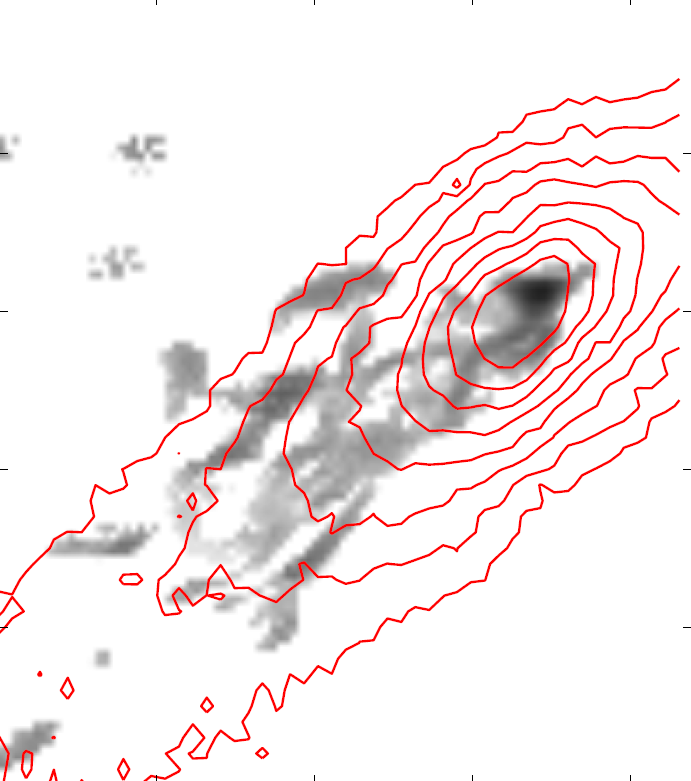 Radio Astron takes interferometry to extremes. 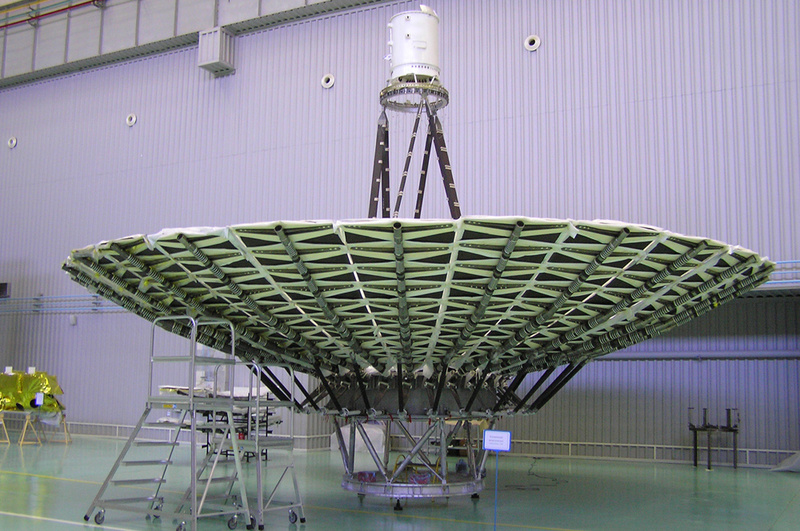 This is a 10m diameter Russian radio telescope... iinnnn sppppaaaaacce ! 10m is too large to launch a conventional reflector, so, like a giant umbrella, it was folded up during launch and unfolded once in space. Working in conjunction with ground-based telescopes, it can effectively form part of a telescope 350,000 km across. Given the existence of a telescope larger than the Earth, the question of the "world's largest telescope" seems a tad petty. Because the world is not enough. Then again, up until now we've been biased by assuming that telescopes have to collect light emitted by distant objects. This isn't always the case. Neutrinos are particles (so not even part of the EM spectrum at all) of almost zero mass that almost never interact with anything - most of them pass straight through the Earth unhindered. Building a camera to detect them isn't really an option. So neutrino telescopes work in a completely different way : they detect the light emitted on the (very) rare occasions when a neutrino does happen to interact with, say, a water molecule. Yes, that's a boat. Yes, there was a missed opportunity for a Bond movie here. The spheres house the sensors that will detect the light emitted by neutrinos colliding with water molecules (when the entire tank is filled). The Super-Kamiokande neutrino telescope seen above holds 50,000 cubic metres of water in a cylindrical tank about 40m tall and 40m across. For more "normal" telescopes, the area of the reflector determines how many photons of light you can detect. For neutrino telescopes, it's volume that matters, not area. Which makes them fundamentally different, so we can't really compare them to classical telescopes. That would be completely unfair, so let's do it anyway. 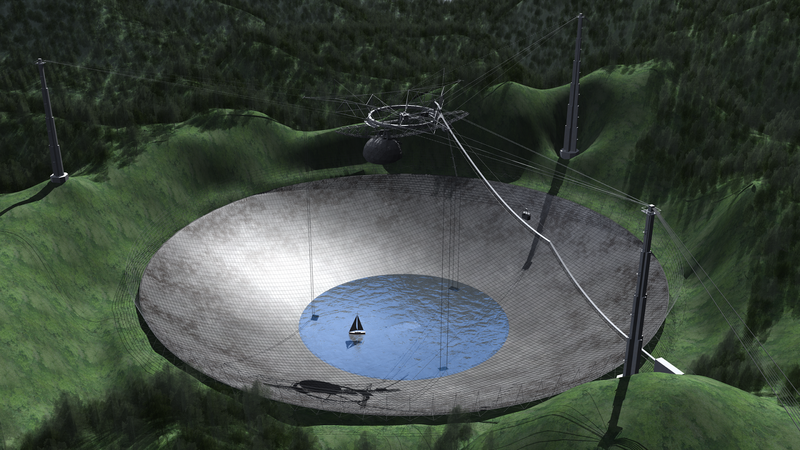 If we emptied all the water of Super-Kamiokande into Arecibo, it would only fill the reflector to a depth of about 8m. Assuming it somehow didn't just drain away, which it would. Critics agreed that budget cuts to the remake of Goldenye were a mistake. So, can radio astronomers point at laugh at all the other astronomer's puny instruments ? Possibly, but it would be inadvisable. For one thing, there's another, much bigger neutrino telescope : IceCube. Instead of building an enormous tank filled with liquid water, this is an even more audacious project using the ice of Antarctica. Buried over a mile below the surface are 86 boreholes each filled with 60 detectors, enclosing an entire cubic kilometre (1 billion cubic metres) of ice. 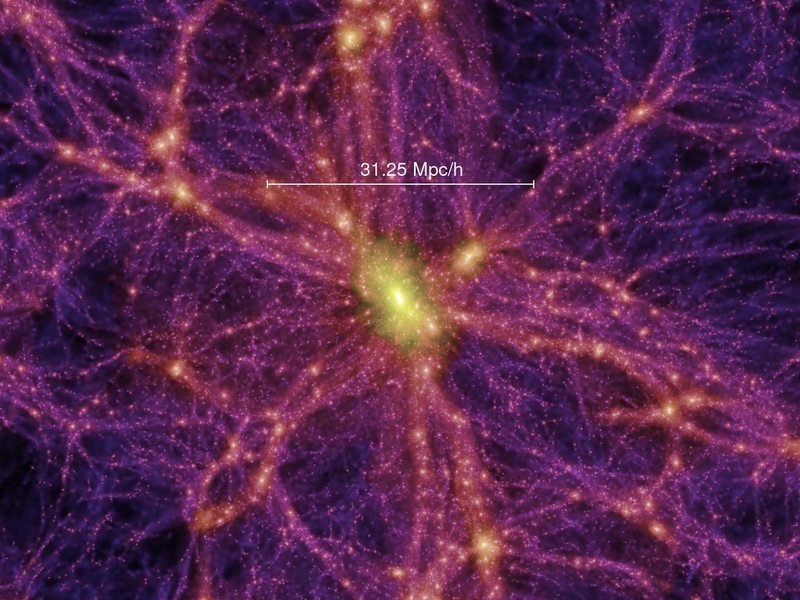 That's a mass of 900 million tonnes - easily enough to crush Arecibo a like a puny little bug. Still, although its mass is much, much greater, a mere cubic kilometre is paltry compared to the 350,000 km baseline of Radio Astron. For now, then, radio astronomers can laugh at other scientists as long as they're very very careful about it. Neutrino telescopes may have the most physical mass, but radio telescopes have the biggest reflectors and the largest diameters. They're likely to retain the prize for biggest mirrors for the foreseeable future, but another exotic type of astronomy has the crown for largest diameter firmly in its sights. Gravitational waves are nothing less than ripples in space itself, produced by any moving object. These distortions should be detectable using a system of lasers and mirrors - roughly speaking, if a wave passes through, the length between the mirrors changes, altering the time it takes the laser to travel along its path. The path of the laser beam needs to be as long as possible since the changes are damnably small. Current detectors have laser paths a few kilometres in length. Much to the disgust of other astronomers, none of these facilities have ever detected anything. In fact, it's the radio astronomers - yet again - who can point and laugh, since the only convincing evidence for gravitational waves comes indirectly from observations of binary pulsars (first measured, by the way, at Arecibo), whose orbital decay is in perfect agreement with the predictions of general relativity assuming they're emitting gravitational waves. However, unless something is staggeringly, astonishingly wrong with the theory, given enough time it will be possible to directly detect gravitational waves. Fed up of other astronomers calling them "gravy waves", the GW community has hatched a foolproof plan to massively increase sensitivity and make absolutely sure if the pesky things are real or not. And that involves another giant space telescope - one that makes even Radio Astron look just a little bit pathetic. If it works. 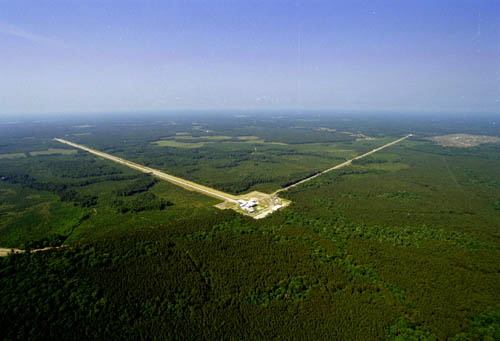 The LISA gravitational wave observatory will use lasers to create a telescope ~5 million km across. This is a no-lose situation. If it works, we'll have a whole other way of studying the Universe. If it doesn't - I mean if the telescope itself functions correctly but fails to detect anything - it will be the greatest non-detection since the aether, and a scientific revolution is sure to follow. And, best of all, until it's built the rest of the astronomy community can continue to poke fun at the gravy wavers with all their oh-so-interesting noise measurements. So, there you have it. The world's largest telescope is a tricky question to answer, and maybe even irrelevant. Already we have telescopes as big as or even larger than the world, in some sense, with more on the way. And that's just artificial telescopes. 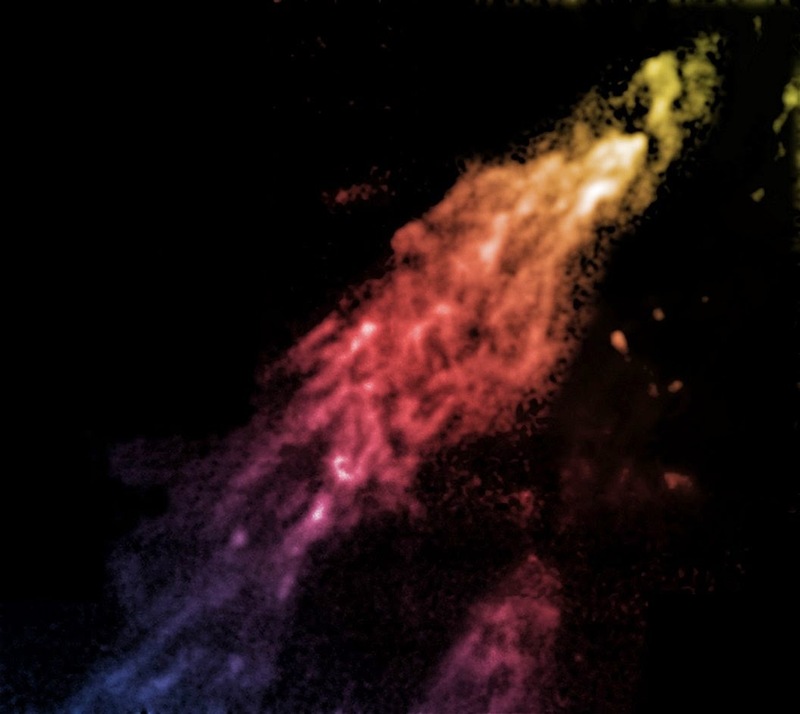 Arguably, even more exotic techniques like pulsar timing arrays and gravitational lensing use entire galaxies to form natural telescopes. But that's another story. Sometimes I don't bother posting anything because I'm lazy. Well, Game of Thrones isn't going to watch itself, is it ? You're goddamn right it isn't. Other times, as lately, I don't post anything because I don't have time to. First, my parents visited. Hurrah ! I had all of two - count 'em TWO visitors in two years at Arecibo. And that's an average. "An average ?" Yes, an average - one person came specifically to visit me (although that was tacked on to an observing trip somewhere else in America-land), one person I'd never met before but was planning to work on AGES, so doesn't really count, and the other I've only met at conferences, and - surprise surprise - was there mainly for a conference, so also doesn't really count. The excuses, "it's too far", "I can't drive", "it's too expensive" are all perfectly valid for Puerto Rico, but don't pass muster with Prague. And since another visitor is lined up for the end of the month, my visitor rate in six months has already exceeded that from 2.5 years in the Caribbean. With my parents, we mostly explored things I've already seen before, so I won't repeat them. Perhaps the highlight was wandering through the Wallenstein Gardens, which I had not done before, and discovering a pure white peacock. It was displaying the moment we entered, but didn't do it again. My mission is now to keep going back there and get a photograph of the peacock in full "look at me I'm a giant Elizabethan ruff" mode. There were also regular, crappy peacocks. The other noteworthy thing about the gardens is that Prague has again failed at dragons. This time it's a statue of Hercules fighting a small though ferocious-looking dragon. Nothing wrong with that, except that it's abundantly clear that Hercules has really got the upper hand. Specifically, he looks like he's about the knock the poor thing's head off. It doesn't stand a chance. We also visited the senate halls, which are resplendent and made a nice change from all the churches, and Petrin hill, because you can't really go wrong with Petrin hill. This time we went inside Štefánik Observatory, which has quite a nice public exhibition. It even has a little panel about Arecibo, and I learned that "Sondy" means "probes" in Czech. As in "meziplanetarni sondy" - interplanetary probes. Which I think must be very funny if you're a planetary scientist and your name is Sondy. The week after that I was back in Cardiff giving a seminar. For seminars these days I'm trying to up the ante on the theatrics, which means a lot of preparation time - pretty much every spare evening beforehand. 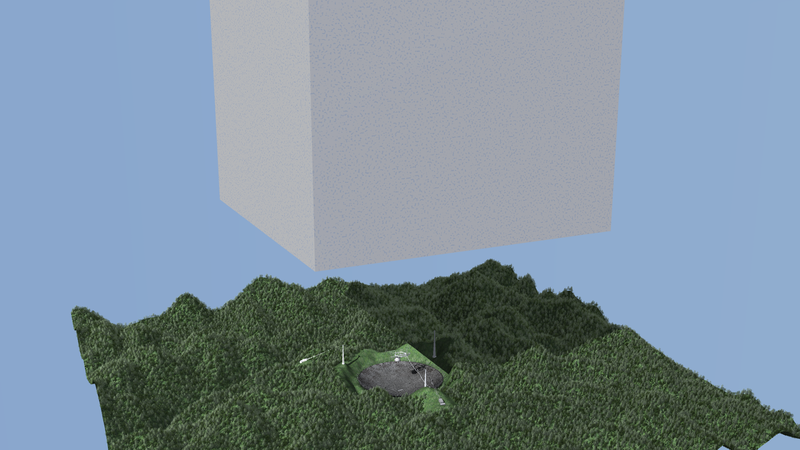 The title is, "The Arecibo Galaxy Environment Survey : Science with a Lonely Smurf and a Talking Moose", and it includes a physical data cube and three properly 3D movies. As in the old-school 3D glasses. None of this fancy full-colour nonsense. I've been wanting to do this for years. Full colour versions can be seen in this video. 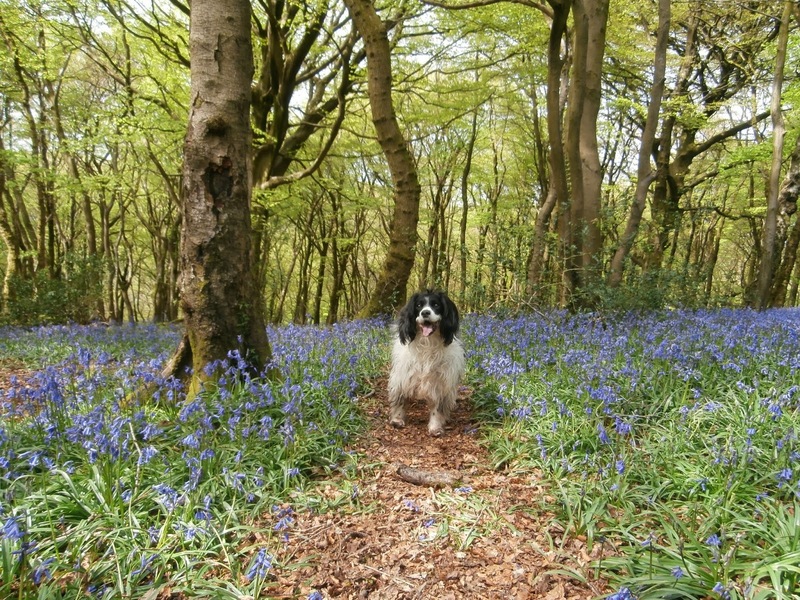 There's not a lot else to say about Cardiff other than that May is bluebell season, which doesn't sound so impressive unless you realise that they grow by the million. Add in a large friendly dog and we have ourselves a winner. We also went to the sand dunes at Merthyr Mawr - yes, Wales has sand dunes, believe it or not. The Czech Republic does not have any coastline, of course, despite some laudably hair-brained schemes to overcome this particular difficulty. The problem is I've been spoiled by the ridiculous warm waters of the Caribbean, and Merthyr Mawr is more on an estuary than the actual sea. You can see the other side, for heaven's sake. Which left the whole experience somewhat unsatisfying. 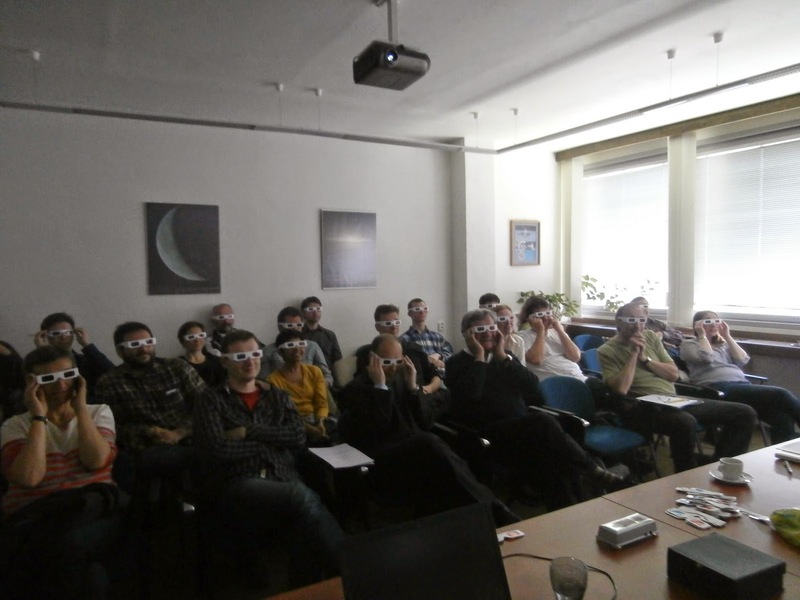 Once back in Prague I gave the same seminar in Ondrejov, where the other half of the institute is located. 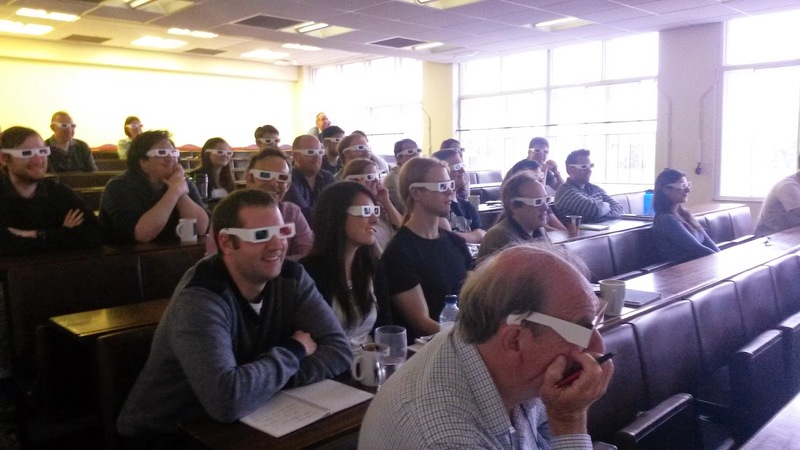 The 3D movies were just as popular, though overall the reaction was a lot more muted than in Cardiff. Several people fell asleep. Well, I was battling a cold at the time, and it's very difficult to speak with any enthusiasm when you can't actually hear even how loud you're speaking. It probably also doesn't help that the galaxy group is a lot smaller in Prague and there were very few native English speakers in the room. This done, I pointedly spent the rest of the week watching Netflix and DVD box sets, because I'm sick of doing science in the evenings. I don't like ad-libbing in front of large audiences, hence I end up repeating the entire 50-minute talk to an empty room again and again and again. Anyway, that's how I spent the last two weeks. No more seminars in the foreseeable future - the next conference is in Vienna, but mercifully that's a poster presentation. And a jolly good thing too, because short of buying an Occulus Rift, or baking everyone a cake, I have absolutely no idea how I raise the stakes for the next talk. Fireworks ? Cheerleaders ? * Random pictures of cats ? Further research is required. * If nothing else, a letter-by-letter chant for "extragalactic neutral atomic hydrogen" would probably obviate the need for an actual talk.